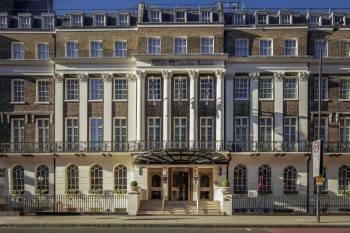 The Hilton London Euston Hotel is set in a stunning Victorian building only five minutes from Euston Station and ten minutes from Kings Cross St Pancras and Eurostar terminal. Within a mile of London’s city center and attractions such as Oxford St, Camden Town, Regent’s Park and the British Museum, this London hotel the ideal place to stay to experience everything London has to offer.Relax after a busy day in the cool tones of the guest room, featuring convenient amenities such as WiFi, a large work desk, LCD TVs, and a beautiful marble bathroom. Upgrade to a Deluxe room and experience more space, and a comfortable fluffy bathrobe and slippers, amongst many other special touches.This Victorian Bloomsbury townhouse hotel offers meals in the conservatory of Woburn Place dining room. Bask in natural light as you dine on the delicious international cuisine, or host a banquet on its terrace. Hold a wedding or a special event in one of the 11 stylish event rooms that hold up to 110 people. Book a meeting in one of these versatile rooms and make use of the professional amenities such as video conferencing and WiFi. Here at Hilton, we provide the space, style and attention to detail that you want and expect. From grandiose galas and meticulous meetings, to private parties and social soirées, expect personalized service and all the amenities to host a successful event. Within walking distance from Euston station and King’s Cross & Eurostar terminals, Hilton London Euston is the ideal base for conducting a business meeting.